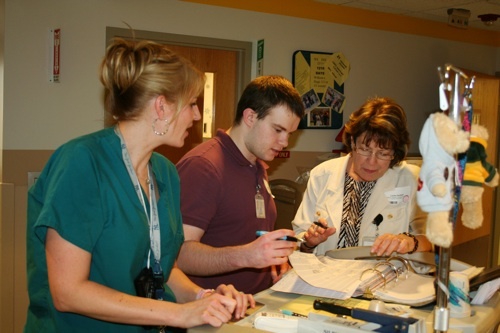 Sussex/Passaic Community College nursing student Mitchell Klein, center, reviews a patient’s chart with Matheny nurse Carrie Fordham, left, and Sussex/Passaic CC nursing instructor Linda Zenkert. To help ensure that there will be a steady supply of nurses trained in the care of children and adults with special needs, we sponsor nursing programs at three area schools: Sussex/Passaic Community College in Newton, Raritan Valley Community College in Branchburg and Warren County Community College in Washington. These nursing students are also a source of recruitment for Matheny’s nursing department. Nursing at Matheny is a rewarding experience. Our focus is on maintaining patients’ wellness so they can benefit fully in our therapy, education, recreation, community and fine arts programs. Because Matheny’s patients’ needs are complex, our nurses have to be competent in a broad spectrum of practice applications. This entry was posted in Uncategorized and tagged nurses, nursing, Raritan Valley Community College, Sussex/Passaic Community College, Warren County Community College. Bookmark the permalink.